Talk about cutting it fine; I had no idea Bout of Books was starting next week. I’m really glad it is though, as I have some good reads lined up on my TBR pile and I can’t wait to start them. 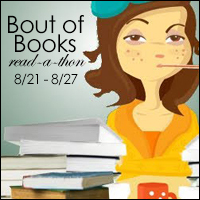 Having a read-a-thon to participate in at the same time is just an added bonus! Start reading The Ninth Rain by Jen Williams (because I’ve wanted to read it for some time now). It’s Bout of Books time again. I’m hoping to settle down with my book this afternoon so will update on the day’s progress tomorrow. Had a great afternoon of reading Darien. Talk about a page turner! It’s all action at the moment, which made it really hard to put the book down. I’m really enjoying the first book of this new series and will definitely look out for the next one. The only downside is I can’t imagine it will take me much longer to finish the book and I don’t really want it to end! Completed Darien yesterday. Can I have the next book already please?! I wonder if it will follow the same characters and their stories, or whether it will focus on another area and another set of people? I even managed to complete my review and get it posted to the blog, here, and now I’m going to have a look at The Ninth Rain. There’s always one day isn’t there? That day when you just don’t manage to get any reading done. Well, this was mine, so hopefully I’ll have more to report next time I check in. Much better day for reading. I’ve never read anything by Jen Williams before; she’s a new-to-me author, and The Ninth Rain is very good so far. I can already tell that Vintage is going to be a new favourite character, so I really hope she makes it to the end of the book. What usually happens when I find a character I really like is they meet some awful demise before the book reaches it’s conclusion. Here’s hoping that doesn’t happen this time. Oh dear, not the best day for reading today, but at least I did manage a (very) few pages. Had another good reading session and managed 100 pages; I didn’t think I’d manage that again before the end of the read-a-thon. I wonder if I can make or pass 500 pages this time around?! I’m quite a slow reader so I’m not sure, but I’m going to try. wow, wonderful! keep it up! Great page count – and I hope this last day goes really well for you 🙂 Hope you hit 500!! I’m hoping to hit 300. Thank you 🙂 I had a really good last day reading – hope you did too!